* Dedicated trainer board for each wave shaping circuit. * Construction and study of Colpitt’s oscillator which contains a tuned L – C circuit with transistor and inductance. * Study the charge in output frequency by changing L – C combinations, by varying inductance ‘L’ and / or capacitance C.
* Determination of the frequency of oscillation using the formula. * Verification of observation and calculated frequency. * Test points provided at various stages in the circuit. 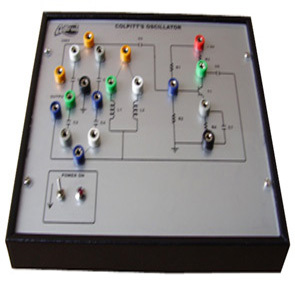 * Housed in an elegant metal cabinet with a well spread intelligently designed circuit layout on the front panel. * Built – in DC regulated power supply with short circuit protection and LED indication for supply “ON” to works on 230V AC Mains.